Grand View native, Karl Wallin, has assembled an outstanding cast of professional musicians from around the United States to play in the 12 Hour Music Marathon. Starting at 11 am on Saturday, a cast of many will begin with acoustic soul & bluegrass. The afternoon will move to a blend of classic favorites. In the evening, kick up your heals and dance until 11 pm with Classic Rock and Blues. This is a Live Music Marathon you don’t want to miss. 11:00 am – 4:00 pm: Featuring Bob Bruce, Max Winkels, Andrea Christopherson and Lisa Freelund. Max Winkels: From Milwaukee, WI. Plays banjo, guitar, and vocals. He is the “Super Picker” of the bunch and has played with Easthill Bluegrass Band. John Bertsch: Saxophone player extrodinare! Played with Ron Pope, Sam Moore, The Temptations, Frankie Valli & the Four Seasons, Gary US Bonds, Peter No One of Herman’s Hermits, Davy Jones of the Monkees, Lou Christie, The Drifters, The Coasters, The Platters, Tommy Roe, Leslie Gore, Sonny Geraci, The Shirrells, Freddie”Boom Boom” Cannon, Ben E. King, and Percy Slege. From Minneapolis, MN. Rob Wernberg: Plays guitar, banjo and mandolin. Rob played 3 years at Opryland and 2 years in the Branson House Band. He toured with Danny Davis and the Nashville Brass, Jack Daniels Silver Cornet Band and the Atomic Tailfins. From Madison, WI. Tim Jauernig: Plays guitar and owner of Handmade Guitar Effects Pedals. And the gentleman that pulled these outstanding groups together: Karl Wallin! Karl has performed 2 years in Opryland and toured with USO tours around the country. He plays bass, guitar and has played with Greg Koch & Other Badmen and the Atomic Tailfins and many more! 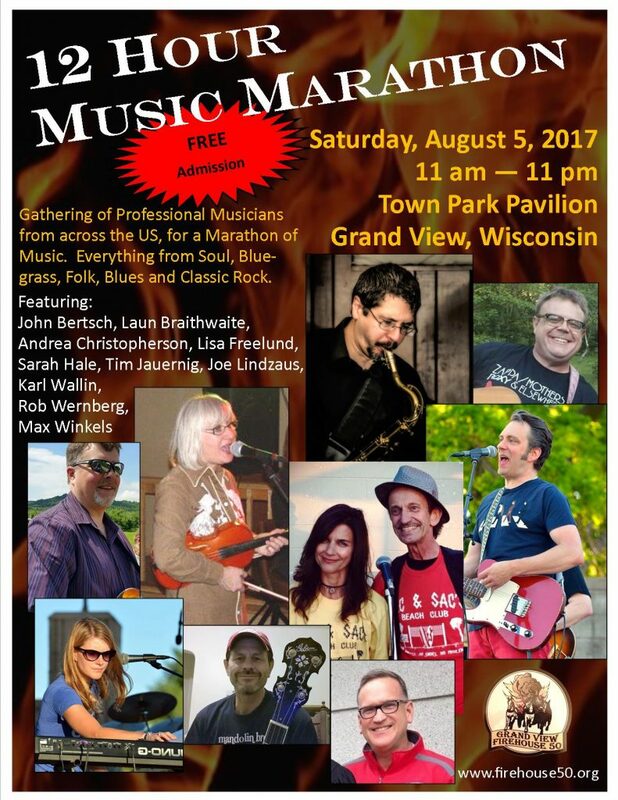 Several musicians will be back on Sunday to perform in a Old Fashioned Jam Session, including Grand View native, Brian Pierce on the harmonica.